The Dawn of a New Ethiopia, or the Last Gasp of Calm Before the Storm? Ethiopia is experiencing the thrill of a government it can put its hopes, its dreams, and its yearning for modernity onto. The new Prime Minister of Ethiopia, a fresh-faced 42 year old reformer named Abiy Ahmed, seems set on a mission to remake his country and faces tasks that would humble lesser figures. He faces a country ravaged by ethnic conflict, primarily surrounding his own ethnic group, the Oromo; a nation that, while growing at rates that are coveted by its neighbors, still faces the poverty, lack of education, and lack of infrastructure that is characteristic of the continent; a political apparatus that is as oppressive as it is unpopular; and an uncomfortable pseudo-war with a long-time enemy, Eritrea. Ahmed, having only been in power since April of this year, has shown remarkable ability to try and handle all four of those issues. He has proposed wide ranging democratic reforms to remake the dictatorial regime beset by ethnic tensions; he has promised liberalization of the economy to both encourage foreign investment and shore up Ethiopian finances; he has attempted to calm the Oromo by showing them that he, a Oromo himself, is in charge now, bringing an end to their oppression; and, most dramatically, he has gone about normalizing ties with Eritrea, building peace and diplomatic friendship with a nation which only recently Ethiopia viewed as a tenacious enemy. Despite this, Ethiopia faces colossal challenges on the road to becoming a model example of peaceful, democratic transition. Firstly, the established old guard of the country, the rest of the the Ethiopian People’s Revolutionary Democratic Front (or EPRDF for short) that has ruled the country since overthrowing the communist Derg in 1991, is likely going to oppose Ahmed’s reforms, primarily because they could potentially embolden opposition to the coalition, causing them to lose power. The liberalizing economic reforms may also disentangle the economy of the country from the grasps of party members. The situation gets even more difficult politically given that Ahmed’s party in the coalition is likely to face opposition from the party of the previous Prime Minister, whose resignation in 2018 allowed Ahmed to come to power. He was a member of the Tigray People’s Liberation Front (TPLF) – the Tigray being an ethnic minority whose members have governed the country with an iron hand for the past two decades. Additionally, the government faces the classic problem with rapid reforms: the situation could get out of hand. A nation, used to the oppressive apparatus of the state, could become so invigorated by the progressive reforms of the Prime Minister that if they fail to fix every perceived shortfall, no matter how herculean, than massive opposition to the government could become likely, and the situation in Ethiopia could become untenable as the government is faced with demands it can’t hope to meet. This is not to say that Ahmed’s expansive vision of reforms are a mistake, since it is fundamentally better for the government to attempt to fix structural problems in the country and not let issues fester until they explode into a revolutionary event. The issue is that the EPRDF faces a dilemma of its own creation. The dilemma is this: do you reform now, and maybe lose some control over the country and have to actively compete in elections, but ensure that Ethiopia is internally stable and can perform better economically, or do you try and use the cudgel of violence to clamp down upon internal dissent, and kick the can of reform down the road, ensuring short-term power but in the long-term possible revolutionary conditions. 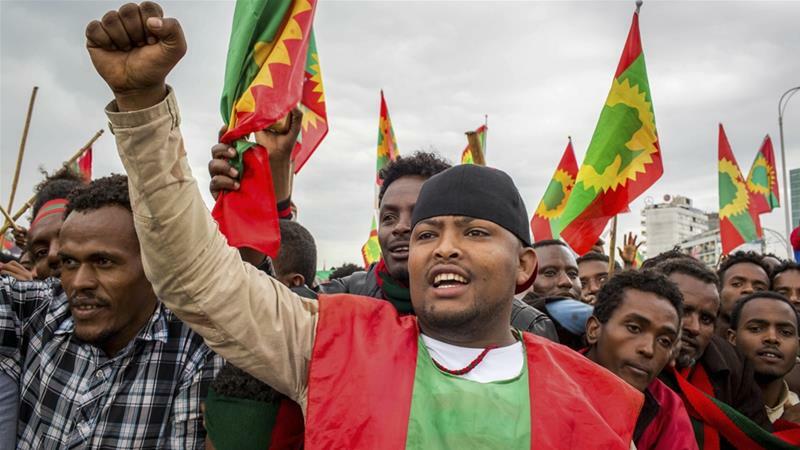 The latter of the two options was the one chosen by the previous government, and upon the resignation of the Prime Minister Desalegn the situation appeared out of control, as the government faced massive Oromo-led protests that violence could not seem to stem. The option was either put to power a young reformer who could alleviate the demands of the protesters, or face possible street revolution. The EPRDF now faces a popular, both domestically and internationally for his proposed reforms, Prime Minister whose removal could destroy the tenuous calm that Ethiopia now finds itself. It’s a Catch-22: destroy him for his attempts at reformation, and the governmental system will be overthrown, but let him reform away and they face extinction through the ballot box. Abiy Ahmed faces conditions that would unnerve even the most confident and talented politician, but seems to be facing them with an elan and force that has caught the whole world off-guard. With a bit of skill, tenacity, foresight, and a great deal of luck, he may find himself the founder of a truly democratic Ethiopia, something the ancient country has never before experienced. If he fails, then Ethiopia faces the horror of a failed reformation, and the internal catastrophe that tragedy would unleash. With all of his countrymen and the world watching, Prime Minister Ahmed must either live up to the dreams of his people, or fall and be destroyed by them.